Yes, a showdown. That’s exactly what just happened over here. In my quest to renovate my own home piece by piece, I have brought beauty and simplicity to one more room! If you read my last post, you saw that 2016 has been a very busy year for me. November hit and I was able to catch my breath for a few days. In the time of rest, I had the itch to redo one of our spaces. We bought our home 5 years ago and have SLOWLY done renovations. The kids’ bathroom is not a high priority (they are 3 boys – enough said). However, they have been hanging their towels over the doors for a couple years because the towel bars were ripped off the walls. They had zero privacy because the only shower curtain I purchased (after we took down the sliding glass doors 5 years ago) was a clear shower liner. And lastly, I was tired of looking at the ugly dated cabinet every time I walked in. I was tired of looking at the plain, ugly bathroom period. And my boys were too! I wanted something better for them! I’ve said this before: Decorating and leaving your mark on a space encourages you to keep it organized and clean. I needed all the motivation to keep the boys’ bathroom clean that I could get, and so did they! As with all projects, I prioritized this one. Though I don’t like the flooring, it’s in good shape and not too much of an eyesore. So we kept it. As far as the vanity was concerned, I knew the light fixture was a must to be replaced. I kept the mirror, countertop, and faucet (kids are rough on faucets so we opted to wait a few years). I don’t like the countertop, but decided to draw attention away from it rather than spend money on a new one. Same with the cabinet since it was functionally great. I decided to simply paint the cabinet and update hardware. For space, look, and functionality, I went with hooks instead of bars for the towels. AND PAINT for the walls. Oh yes I painted those walls! I decided on a light gray for the walls. 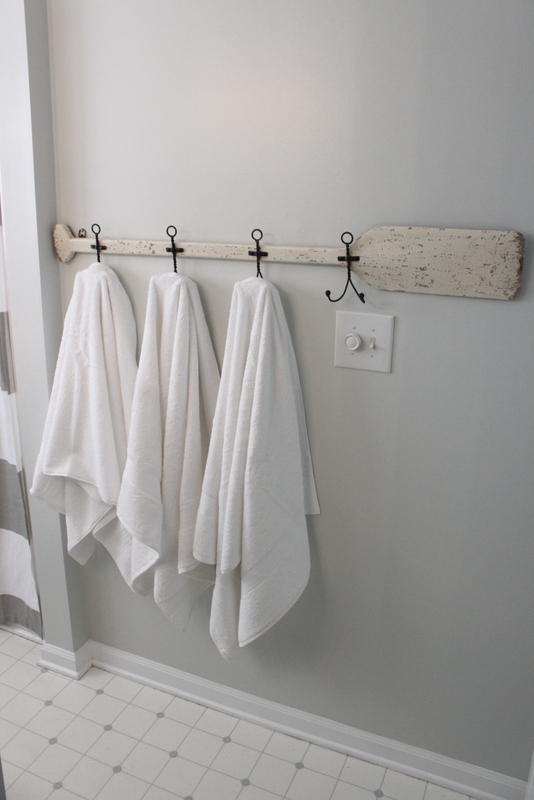 I went with towel hooks instead of a traditional rod, and scored this fun piece at New River Pottery here in Wilmington! Look at the difference made with simple changes! I was a little nervous about painting the cabinet black, but because we kept the light cream countertops I knew white was out of the picture. I’m very pleased with the result! The light fixture is my favorite part! For a wall print, I went with a simple picture of a wave. What space in your home needs a showdown? Now is a great time to set your goals for the new year! vicki - I love this renovation and can’t wait to see it in person!!! You did a fantastic job and I know our boys are enjoying it as well!! Simple Spaces - Thank you Vicki! They can’t wait to show it to you! © 2019 Professional Organizer, Home Staging | Simple Spaces|ProPhoto 4 by NetRivet, Inc.